By the end of the 18th century the British, who were gradually ousting the French and their commercial interests in India, and, to that extent, were the more to be feared by the Indians. For this reason French influence was in the ascendancy at those courts which feared annexation by the East India Company and prominent among these princes was Tipoo Sultan, ruler of the great state of Mysore. Tipoo, a Moslem ruling a predominantly Hindu state, had clashed before with the British (including the 76th) in 1792 and been defeated. Tipoo had been fortunate to be able to continue as ruler with only some minor loss in territory. Cornwallis, at that time Governor General, was opposed to further increasing the Company’s territory. In April, 1798, Lord Mornington, Arthur Wellesley’s elder Brother, became Governor General of India. When he decided, in February 1799, to regard Tipoo Sultan’s negotiations with the French as an excuse for war he had no illusions about the object of the campaign, which was the overthrow of Tipoo’s dynasty and the substitution of British influence. Arthur Wellesley, by now a Colonel, had arrived with the 33rd in India in the same year and joined the force being assembled for the campaign against Tipoo and Arthur Wellesley was put in charge of the campaign preparations. General Harris arrived in February, 1799, to take over. Colonel Wellesley, following the death of the the previous commander in a duel with one of his subordinates, was given the command of the Nizam of Hyderabad’s contingent. At Wellesley’s insistence the 33rd joined the contingent. The 33rd was soon to distinguish itself. By 26th March Harris’s force had reached Mallavelly and were heavily attacked by 20,000 of Tipoo’s horse and infantry. 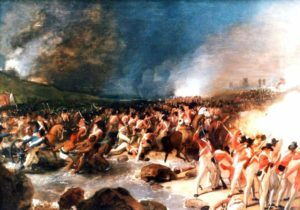 Wellesley’s Hyderabad contingent, including the 33rd, bore the brunt of the attack, the 33rd on it’s own repulsing some 10,000 of the attackers, for which they earned the Commander in Chief’s thanks. By 5th April the force was within two miles of the Seringapatam fortress. That night Wellesley was ordered to clear an enemy outpost. There was no time for reconnaissance, Wellesley became separated in the dark and was temporarily lost, while the 33rd ran into murderous enemy fire and were forced to retire. Eight of their men were captured and taken into the fortress then executed by strangling or by having nails driven into the top of their skulls, The situation was retrieved the following day by a daylight attack and the British then settled down to reduce Seringapatam by siege warfare. The final assault took place on 4th May. General Harris judged correctly that their enemy would not expect this to be launched in the searing heat of midday and within six minutes had driven back the surprised garrison around the breaches. The 33rd stormed through the breaches and hunted the defenders through a labyrinth of buildings, pleasure gardens and bazaars. Tipoo’s body was not found until later, tracked down by General Baird who had led the assault (and a previous prisoner of Tipoo’s father for almost four years) and Wellesley. Tipoo’s wife and children were escorted to safety by the Light Company of the 33rd, Next morning Colonel Wellesley was appointed Governor of Seringapatam and at once set about restoring order among the troops who were fast running amok.